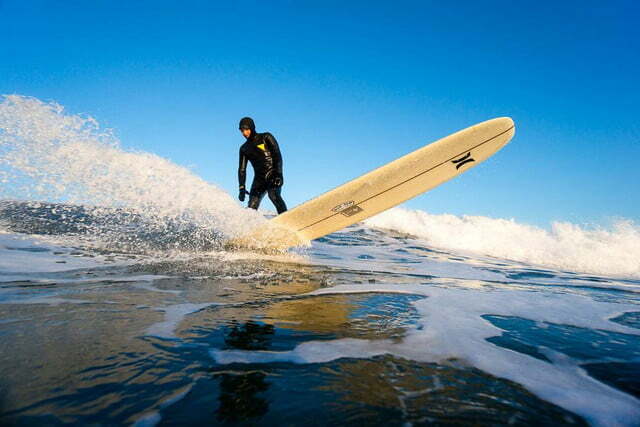 Atlantic Ocean: Surfers who can withstand the chilly temperatures can usually get the beach all to themselves. Jokulsarlon Beach: Years of crashing waves have reduced layers of basalt into the tiny, polished pebbles that comprise Iceland's black sand beaches. 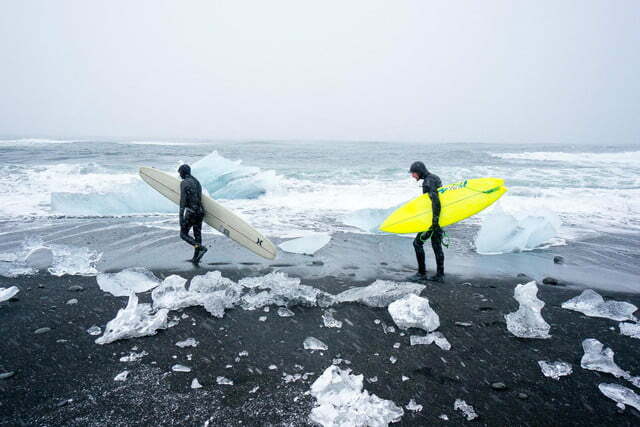 Jokulsarlon Beach: Shores speckled with jagged ice required extra caution from the surfers. Jokulsarlon Glacier Lagoon: Constant glacial movements push icy crags down the mountains and into the Jokulsarlon bay. 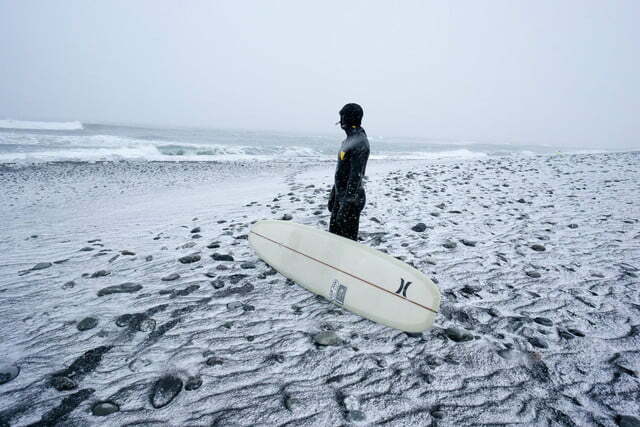 Jokulsarlon Beach: With waters temps in the low 40s, and the chance of sudden snowstorms forming on the beaches, the surfers wore the thickest wetsuits they could find. Reynisfjara Beach: Years of heavy volcanic activity have given Iceland its craggy, dynamic terrain. 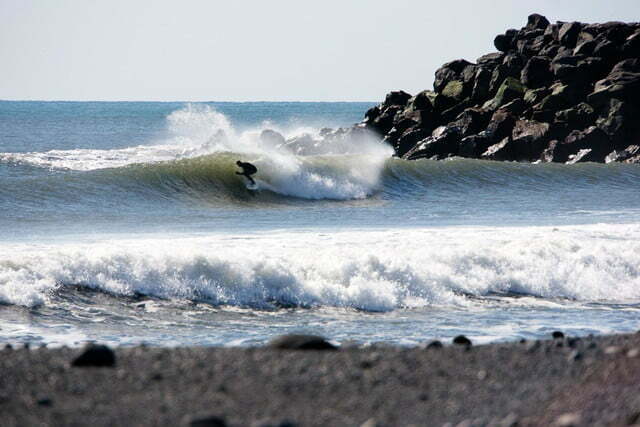 South Coast: Burkard often had precious little daylight to work with. The sun is only up for four or five hours in some parts of Iceland during the winter. Jokulsarlon Beach: This is located right off of Iceland's Ring Road, which circles the entirety of the island country. 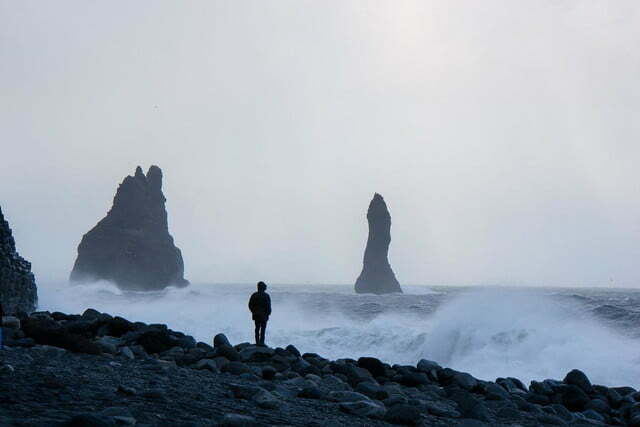 South Coast: Höfn’s mountains, which lead straight into the ocean, are imposing figures on the southern shore. 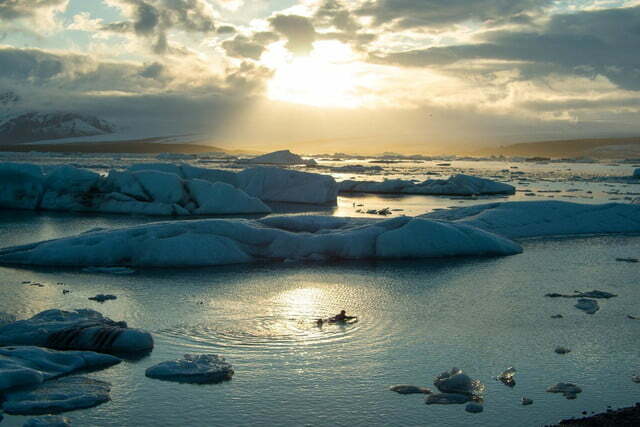 Jokulsarlon Glacier Lagoon: The picturesque glacier lagoon at Jokulsarlon has made several Hollywood cameos, including the snowy training sequence in Batman Begins. 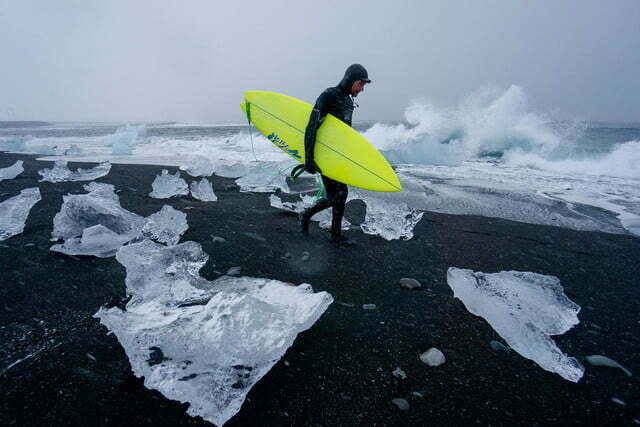 Jokulsarlon Beach: There are very few places in the world where you can find ice on the shores of a beach. 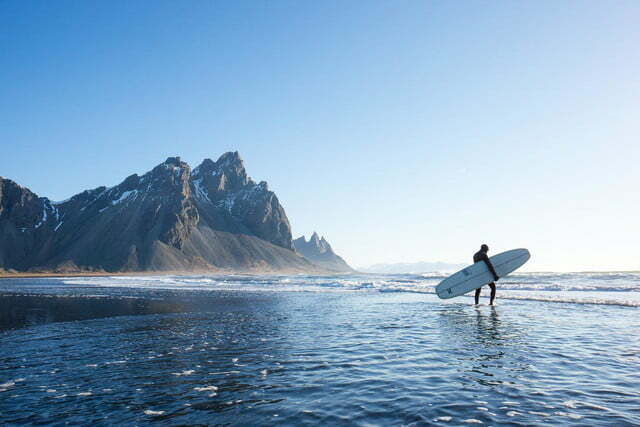 There may be among you, dear readers, many who have had the opportunity to surf the waters of the Atlantic and Pacific Oceans, but it’s safe to say that very few have hang ten off the chilly coast of Iceland. 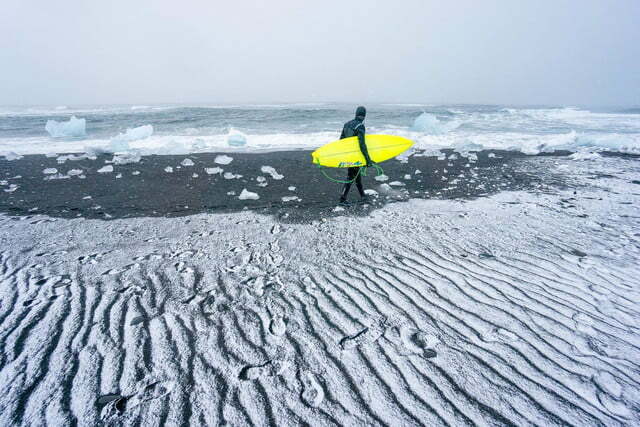 That’s what some Nordic travelers did, braving the North Atlantic waters to surf against a surreal backdrop of snow, ice, and volcanic black sand – all for the lens of extreme adventure photographer Chris Burkard. Iceland’s dynamic climate is both friend and foe to the outdoor photographer; the extreme northern latitudes keep daylight and weather conditions in a constant state of flux. At any given moment, a break in the ever-present cloud cover can yield a spectacular scene. 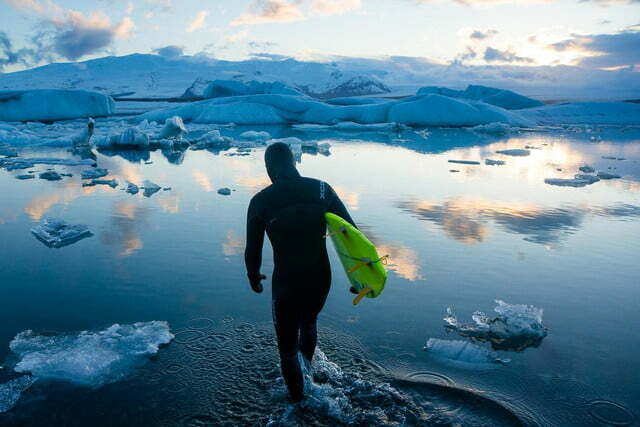 Behind the lens Burkard was able capture the bizarre, beautiful spectacle of surfing in an alien landscape of ice floes, glacial lagoons, and black pebble beaches. Not wanting to miss a second of shooting, he made it a point to spend as much time as possible on location, sleeping in a tent and using Goal Zero solar panels and batteries to power his camera, hard drives, and laptop. 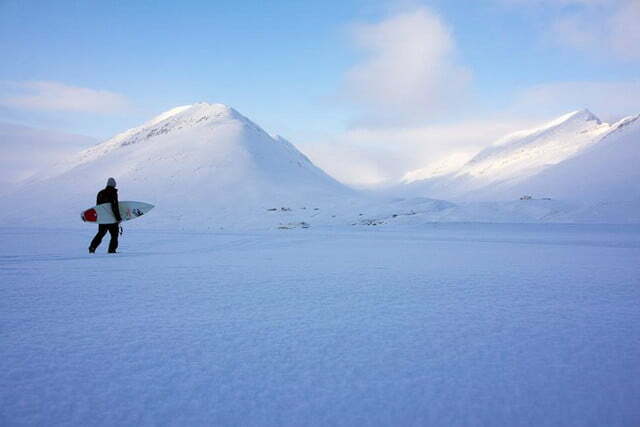 We recently had a chance sit down with Burkard to talk about this snowy surfing safari photo shoot. How did you come up with this type of surfing photo project? I am always looking at ways to share my trips and the images that I shoot on trips with an audience. I have been to Iceland many times and each trip seems to bring back unique stories and a new perception. This photo series was an idea I had to show people how diverse Iceland can be and how I approach shooting images there. What is it about Iceland and surfing that fascinates you? 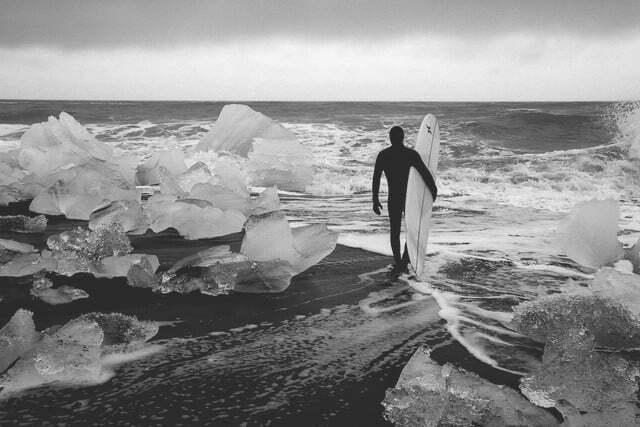 The beauty of cold-water surf is often the work that it takes to score waves that no one else is willing to surf. Most of my memories are all moments of pain or suffering while in these chilly conditions. These stories make a trip exciting to relive, and the chance of scoring great waves or seeing beauty out in nature all is a bonus. I have traveled to Iceland, Norway, Alaska, Canada, Russia, and many other cold-water destinations. These images are just a taste of those experiences and the adventure and sights that can be found when you step out of your comfort zone and search. How did you prepare yourself to shoot in extreme conditions like this? A majority of the prep work happens the months and weeks prior to leaving for a trip. I will put in countless hours researching the zones I will be traveling in effort to find out as much as I can in terms of culture, weather, locations, etc. Making sure I have my equipment dialed is another huge component of prep work. I try to pack with a minimalist mindset, only bringing the bare essentials. That is sometimes hard especially when prepping for cold weather, but with years of going to these destinations under my belt I have got a system pretty dialed. I have a good grip on what bags to bring, how much gear to pack, and all that really comes into play as I am always on the move when traveling and don’t want any unnecessary gear slowing me down. Other than that, I try to keep in great physical shape so I can withstand anything that I have to deal with while on the road. I would never want to miss a shot just because I don’t have the stamina or physical ability to be in the right spot. How were you able to power up all your equipment and keep it running in those conditions? It is amazing to see how Goal Zero (solar) products have really allowed me to not only discover more isolated places, but have the ability to wait out storms and swell to score great moments and waves amidst the ever changing landscape. No longer do I have to drive hours back into the nearest village to charge my equipment for the next day as chances to shoot pass me by. I can always be mobile allowing me to be constantly searching. In that constant search are the moments that I capture my best photos. With the newfound freedom that Goal Zero’s products have given me I can’t wait to see where they take me next. What gear did you use for the shoot? Camera equipment: Nikon D300s, Sony NEX-7, NEX-6, 50mm, 24mm, 18-200 mm, 70-200 mm lenses. Solar equipment: Goal Zero Sherpa 50, Yeti 150, Nomad Solar Panel. What were the biggest challenges in this shoot? One of the biggest challenges of this shoot was wanting to be in a thousand places at once. The days were actually super long so we would get very little sleep and sometimes would be shooting from 4 a.m. until midnight. With the best light being at sunrise and sunset, we found ourselves working long hours, which was one of the bigger challenges. Beyond that it was the usual frigid weather that always brings challenges. Some days the air temps would be below freezing and keeping your hands warm is a losing fight against the elements. Other days we would pull up to a spot with clear skies and within 20 minutes be amidst in a blizzard. In Iceland the weather is constantly shifting and it seems every 30 minutes brings a new weather front. What was your best experience that you took out of this project? One of the best experiences from the trip was the day we pulled an all-nighter camping in a zone near Höfn [in Iceland]. We set up camp on the beach and watched as the sun set late in the evening around 10 p.m. We were amazed how light it stayed and next thing you knew we had been shooting images and it was 2 a.m. and the sun was rising again. The sunrise was unlike anything I had ever seen. Those few hours between sunset and sunrise were surreal and I marveled at the mystery and beauty of nature. How did you get into shooting extreme adventure photography? I have always been drawn to extremes, whether it is nature or adventure sports. Shooting surfing is something I have been doing since I was in high school and as my work progressed I found myself drawn to extreme surfing conditions. Traveling, exploring, and capturing the stories that accompany the adventure of being on the road is really the only type of photography I saw myself shooting even as I started. I try to stay true to this and usually only take jobs that cater to an aspect of adventure or extreme travel. Where is the most extreme spot on Earth you’ve ever shot? There are a lot of places in the Arctic that I have been that have extreme weather and get pretty cold, but the one factor to me that makes a place even more extreme is the wildlife. When I have traveled to places like Alaska and parts of Canada the concern of bears and mountain lions are all too real. I am always looking over my shoulder as we explore those coastlines and never feel 100-percent safe. Any tips/techniques would you like to pass onto our readers looking at shooting arctic or conventional surfing? Shooting in the arctic is all about prepping for any conditions that may arise. As far as any tips in photography, I think one of the best things to develop is a unique style to your images. You want your work to get to the point that people can see an image and identify it as yours without any photo credit. Chris Burkard is a self-taught photographer and artist, based in Central Coast California, whose work is layered by surf, outdoor, lifestyle, and travel subjects. With ocean as his main muse, Burkard has consistently captured this subject in timeless and expansive photographic impressions, utilizing the tool of surfing to approach the ocean’s intricate personality and then extending out to include the human personalities that draw meaning from this same source. At the age of 26, Burkard has established himself as a known name in the surf and outdoor industries, accomplished a deep body of work, held staff and senior photographer positions, and has been recognized continually for his distinct creative compositions. 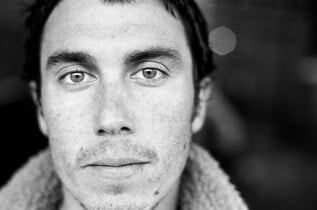 Currently, Burkard serves as senior staff photographer for Surfer Magazine, contributes regularly to various international publications, and is a project photographer for Patagonia as well as several other respected brands. Burkard has completed two book projects, one with friend and co-author Eric Soderquist, titled “The California Surf Project” (2006) and the other, “Plight of the Torpedo People,” accompanying Patagonia body surfing film, “Come Hell or High Water” (2012).